Running today through Sunday, ConDFW is the place to be for readers and writers of speculative fiction or genre fiction. With panels on publishing, writing, marketing, world creation, and RPG creation there is a little something for everyone. You can also take part in the 7th Annual ConDFW Sci-fi Spelling Bee! Author Guest of Honor is Cherie Priest. 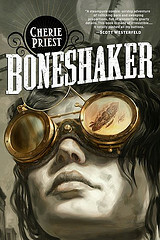 Cherie is the award-winning author of ‘The Clockwork Century’ series of steampunk novels starting with “Boneshaker,” which I thoroughly enjoyed. Artist Guest of Honor is William Stout. Clicking through his gallery, you’ll recognize his work readily if you’ve seen the movie posters for ‘Wizards’ or ‘Life of Brian’. I was even surprised to find some that I didn’t expect! Check out the website for panel times and guest readings! Who are you looking forward to seeing?